There was a moment in The Rocky Horror Show when the skilled narrator Steve Punt ad libs with the audience saying 'this isn't a panto you know' and someone retorted 'oh yes it is'. And they couldn't be more right as this interactive, lively show that has been around for over four decades is very much in the style of an adult x-rated panto. That's probably what has maintained its success as each performance is slightly different based on the responses and camaraderie from the audience. It keeps people coming back for more, often in little more than their corset, stockings and suspenders. Richard O'Brien's The Rocky Horror Show is back on a UK tour and at Birmingham's New Alexandra Theatre from October 10 to 15. It stars Radio 4's The Now Show presenter and comedian Steve Punt doing a fantastic job as the narrator, using his comic timing and improv abilities to perfect use. Meanwhile, Liam Tamne from The Voice maybe a relative newcomer but plays the infamous role of Frank N Furter confidentally. He's saucy and sour but with a sweet, warm voice. 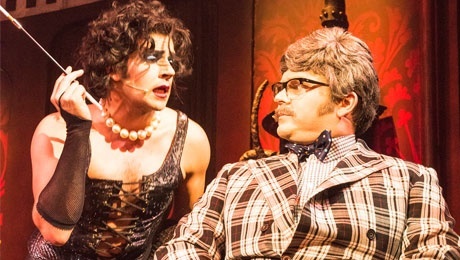 The musical tells the story of two squeaky clean college kids Brad and his fiancée Janet who break down in their car and wander into the castle of transvestite Dr Frank 'n' Furter. Bringing them both out of their comfort zones, the pair have various sexual adventures in the castle to a soundtrack of catchy songs that have become part of popular culture, like the time warp. 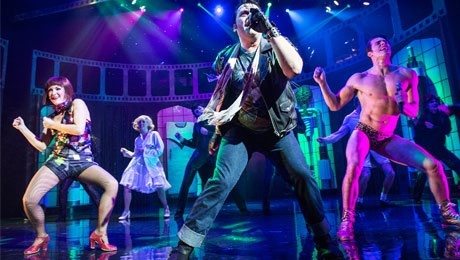 This is a rock'n'roll musical after all and the fine tunes have helped make Rocky Horror a cult classic with tracks from Sweet Transvestite to Dammit Janet. There are some bizarre, crazy plots and characters that make this a light-hearted, game for a laugh show, where anything goes. Hidden among the fun, motley crew of characters is even former S Club 7 singer Paul Cattermole as Eddie and also later Dr Scott under heavy disguise. While forty years ago, this show would have originally broken boundaries with its content on sexual freedom, it's now become more about its audience participation in almost the same way as hecklers at a comedy standup session. It's silly, funny and ultimately you never know fully what you're going to get from the crowd. While the storyline these days hardly raises an eyebrow to most adults, it is worth noting that the show does have a lot of sexual content - more added from the audience than the script - so there is an age limit of 12 with parental guidance. Running Time - 2 hours. Tickets cost £17.90 to £54.90 from the New Alexandra Theatre website.